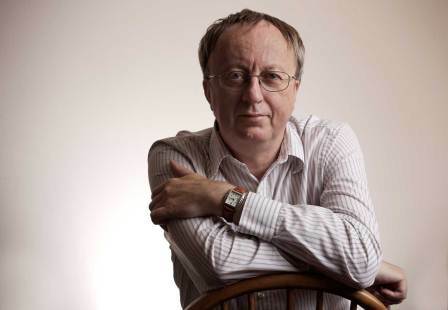 David Hewson is the highly acclaimed author of over twenty brilliant crime thrillers in which location, location, location! is the keyword, closely linked with some of the most interesting investigators enriching crime fiction today. A journalist since he was seventeen, he now uses his skills to create characters and stories that ring true because they are so deeply rooted in the cities in which they are located. After nine novels featuring Nic Costa in Rome and Venice, David Hewson’s new novel, The Wrong Girl, is the second in a series set in Amsterdam and starring Pieter Vos, brigadier in the Amsterdam police, and his sidekicks Laura Bakker and Dirk Van der Berg – not forgetting his terrier Sam. On the day of the traditional Sinterklaas parade, not long before Christmas, two little girls of eight years old go missing, both wearing identical pink jackets. It is a start of a case that takes Vos into the darkness not only of his own city but of international terrorism and diplomacy. Location and characters pair together like gloves in your novels. You write on your website however that in choosing location it is the unfamiliar that attracts you and that you then deeply research it for the novel. Does a particular city attract you as one you want to study or do you have false starts by considering several? Do you ever have a character or plot in mind at that point, or do you wait until you’re there to see what grows? Amsterdam had been nagging me for years to be honest. I first noted down the opening for a book – a man living on his own on a houseboat, thinking his life had fallen apart irretrievably – perhaps ten years ago. After the Italian books I was very careful about where to go next. I wanted it to be northern but with warmth and colour, not like Copenhagen. I’d visited the Netherlands on book tours for years so it seemed a good choice. Another important factor was that I was able to work with my Dutch publisher Boekerij from the start since they published The Killing books very successfully too. That local insight was essential. The focal point of The House of Dolls came from stumbling upon a real-life doll’s house in the Rijksmuseum. The Sunday Sinterklaas turns up in Amsterdam provides the starting point for The Wrong Girl. I happened on that by chance when I went there for The House of Dolls. Writing’s like fishing. If you don’t go out and throw a baited hook in the water you won’t catch a thing. Sitting at home and thinking about a project is nowhere near as useful as pounding the streets trying to land it. You were a journalist for many years on national newspapers. When you then began to write fiction did you find the transition difficult as regards your style of writing or in planning to write at length? Looking back I don’t know how I managed to hold down two jobs that way. I wrote fiction in the morning and journalism in the afternoon. It was very demanding and I’m sure the books became better when I was confident enough to move full-time to fiction. Journalism teaches you some useful habits for writing novels. The ability to research and most of all the complete lack of fear about editing and rewriting. But the things that make books work – imagination and the ability to lie big – get you fired from newspapers. So I don’t think my book writing style had any real connection with the way I wrote for the Sunday Times. Though I’ll always be grateful to Rupert Murdoch for subsidising my early career. Your gripping new novel The Wrong Girl is set in Amsterdam. Do you have other locations you would like to visit for future series or are Amsterdam and Vos so much part of you at present that you need to work this series through first? There are telescope writers and microscope writers. Telescope writers scan a broad horizon to set their tales. Microscope writers look at a very small area incredibly closely. I’m in the latter school. I like to draw a circle round an area and force the characters to solve the problems I chuck at them within that circle. That makes us all work harder. So Vos and Bakker are tied to Amsterdam and will remain so. Though for the third book, out next year, much of it is set just outside the city, in an area called Waterland by what we used to call the Zuiderzee. As to other cities… well I never visit Italy without wanting to write something there. But I don’t think you can choose locations the way you choose destinations for a weekend break. They have to talk to you – and right now only Italy and the Netherlands do that. You write on your website that you were first attracted to Amsterdam as a location for novels ten years before you began to write this series. What was the main image of the city that you carried with you all that time and then became the spark for another series? It was the discovery of the Jordaan neighbourhood where Vos lives in his houseboat on the Prinsengracht canal. It’s a bit like the east end of London – a very authentic, largely working class district undergoing lots of social transformation. There’s a real life café, De Eland in Elandsgracht, which I used as a base when I rented a flat just across the street. The people there were very interesting so I turned it into the Drie Vaten in the book, Vos’s neighbourhood bar. For me the Jordaan is Amsterdam: quirky, independent, a bit awkward at times. When I discovered the police HQ was at the top of the street it seemed too good to be true. As well as the nine Nic Costa novels in a series set in Rome and Venice you have also written standalones. Did you originally see them as standalones or did they begin in your mind as possible series? What are the attractions of a standalone as opposed to a series – or the contrary? The first Nic Costa book was written as a standalone and then my publisher suggested it turn into series. The Vos books I planned as a series from the outset so a lot of thought went into the principal characters. I have another Italian standalone coming out from Severn House in July, The Flood, set in Florence. Interestingly enough people are already asking whether that could turn into a series. It could. We’ll see. I like writing both but sometimes it’s nice to think that a story is finished completely when you write the last page. I like books that seem to start halfway through. In other words we know these people are real already it’s just that we’ve happened upon them at this point of their lives. That way they feel more authentic – not puppets created by a novelist to satisfy the needs of a plot. What happened to Vos before? Well, we know a little. But far from everything. Just enough I think. He’s not a man who looks backwards at all so I don’t feel I need to in his case either. I didn’t live with Vos for a long time before he became clear in my mind to be honest. There are lots of dishevelled men shuffling around the Jordaan who could be him. The plot of The Wrong Girl takes the reader far beyond Amsterdam, widening its horizons to take in international themes, and yet you never lose sight of the basic issue, the missing girls in Amsterdam. Do you see your plots as a whole when you begin to write or do they develop different aspects on the way to the denouement? Sam the dog is a very believable character in the novel and indeed on your website you write that he is based on a real dog. As well as Vos, Nic Costa has a dog. What do you think animals add to a novel: just visual appeal in a film or in the reader’s mind, or do they add more than that? Sam is my tribute to my little wire fox terrier Eddie who died just as I was finishing the book. But he’s more than that. When we first meet Vos he’s jobless and convinced his life’s never going to get back on track. His close relationship with Sam is a way of showing the reader something Vos can’t see: that he’s wrong. He can get back into the world if someone pushes him. And that someone’s Laura Bakker. Dogs are incredibly popular in the Jordaan too – you see people riding with them in the basket of their bikes just as Vos does in the book. The House of Dolls is now in development for Dutch TV and one of the first questions I was asked at a book event in Amsterdam after that was announced was, ‘Will you make sure the dog on TV is a wire fox terrier just like the book?’ I’ll do my best, honestly. You write on your website that the world has changed since you began the Nic Costa series at the beginning of the century. Terrorism is obviously one angle, but are there others that have affected your investigators and how you construct your novels? The biggest change to hit books over the last fifteen years is technology. Mobile phones, the web, data everywhere, people always capable of being contacted. It actually makes constructing stories much more difficult in some ways. No one can vanish easily. One of the reasons I wrote The Flood was I wanted to set a story outside the remit of technology. So it flits between 1966 and 1986 and when the characters in that walk away from a wired telephone no one knows where they are. It’s marvellous. But you just can’t do that in a contemporary book. In real-life policing one of the first things that happens in a serious crime inquiry is that people reach for mobile phone records and CCTV footage. You have to recognise that – and I do. But fiction depends upon conflict and character. So it’s important not to allow the technology to become dominant. Laura Bakker, one of Vos’s team, is a wonderful character; she is so different from Vos in experience, outlook and lifestyle that she adds a lot to the story. She is a country girl from the Friesland area. I will long remember her ‘heavy boots’. Where did she spring from in your mind? Is this an area that you know well? I love Laura because she’s the opposite of Vos. She’s fifteen years younger but strict, judgemental and desperate to make the world a better place. He’s easy-going and just feels his job is to stop the world getting worse. Also there’s absolutely no possibility of a romantic relationship between them. There’s respect, affection and annoyance but never a hint of ‘will they, won’t they?’ That was important to establish from the outset. Do you see London as offering the same scope as the other cities you have dwelt in in your novels or is that something that will remain under wraps to await its turn? As a microscope writer I’d regard London as too big. Perhaps if it was narrowed down to a small area. But to be honest I’d be more likely to write about somewhere like Canterbury, a small city with history and a bit of colour. I don’t like going down well-trodden roads. Empty unexplored ones are always much more interesting. But I’ve no big surprises in store in that area at the moment. Thank you for agreeing to this interview – but one last question: The Wrong Girl is now published, so when can we expect his next case please? The next case is finished and will be out in 2016. As I said much of it takes place in Waterland where two sisters, detained for murder, are released from custody and vanish into Amsterdam. This triggers an investigation into both their disappearance and the murky crime that got them detained in the first place. Did they really do it? Are Vos and Bakker stumbling on a cover-up that goes right to the top of the police? One of the challenges I set myself at the outset was the location. Waterland is largely rural and the people who live there much more in tune with a country girl like Laura Bakker than a city man like Vos. So she comes into her own much more in this story. It’s very different to the first two books, in tone and location. But that, I think, is essential in a series. I want every book to be a fresh start for the characters, not a chance to keep singing the same song. So expect some big surprises in store. The Wrong Girl by David Hewson is published 7th May by Macmillan, price £12.99 in hardback. Buy it here.